Most often I share entrée recipes with you here on my blog, but today I wanted to share a really fantastic side dish with you that I recently discovered on Cooking Light. 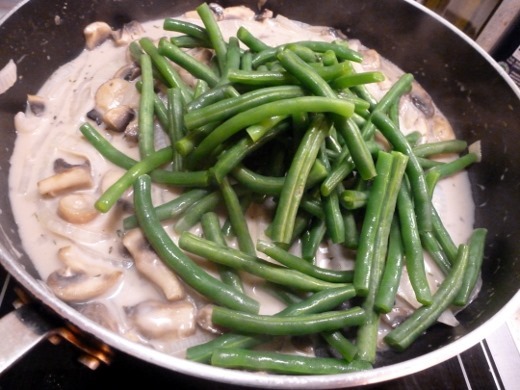 The dish is called “Green Beans with Sherried Mushroom Sauce,” and, naturally, it contains a bit of sherry. If you have not cooked with sherry before, I highly recommend it. But please, do yourself a favor and buy real dry sherry (found it in the wine aisle), and not “cooking sherry” or “sherry vinegar.” This bottle was well under ten bucks, goes a long way, and stores well for a long time. Naturally we need some green beans. 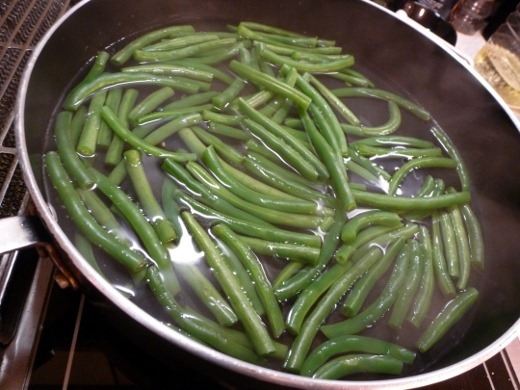 I’ve used both green beans that I trimmed myself, as well as pre-trimmed haricot verts found in my grocery store’s produce aisle. Simmer in a few cups of salted water until tender, then drain, and bathe in cold water to cease the cooking process and prevent overcooking. After your green beans are cooked, wipe out the skillet, add oil, and sauté the onions and mushrooms until soft and lightly browned. Then add the sherry and fresh thyme. I’d avoid pouring straight from the bottle of sherry into the pan for safety reasons (it contains a high volume of alcohol and is thus flammable!). Remove your pan from the heat and use a pre-portioned measuring cup of sherry, to be safe. Then allow the sherry to reduce and cook down. At the same time, the majority of the alcohol will evaporate. Next, we add a bit of flour and let it cook for several seconds, a dollop of whipped cream cheese, and then some chicken stock. Stir constantly while it comes to a boil. Soon the liquid will thicken up nicely, into a rich, creamy sauce, in which you can bathe your green beans. 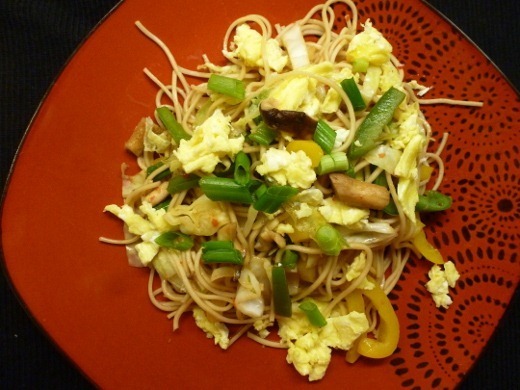 The sauce has a savory depth of flavor from the addition of sherry, a bit of creamy tang from the cream cheese, sweetness from the sautéed onions, and plenty of earthiness from the tender mushrooms. You’ll love it! 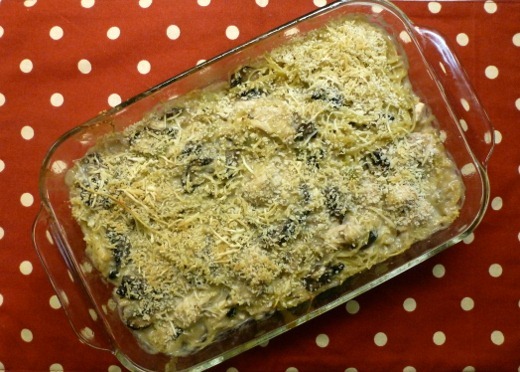 Though this is a somewhat ‘healthified’ version of traditional green bean casserole, the French-fried onions are certainly not omitted. That salty crunch is the best part! Sprinkle them atop the finished dish for maximum yum. 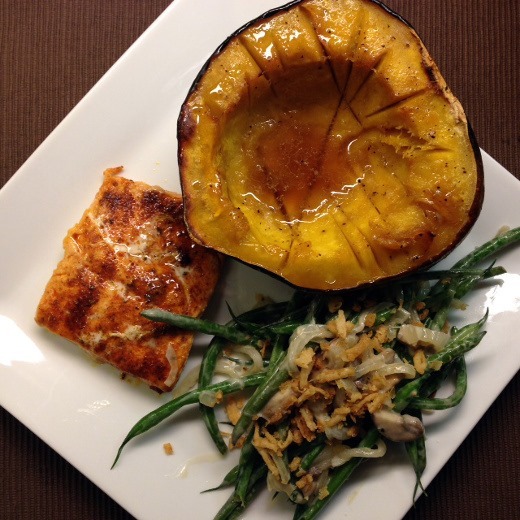 …As well as with salmon and baked squash. 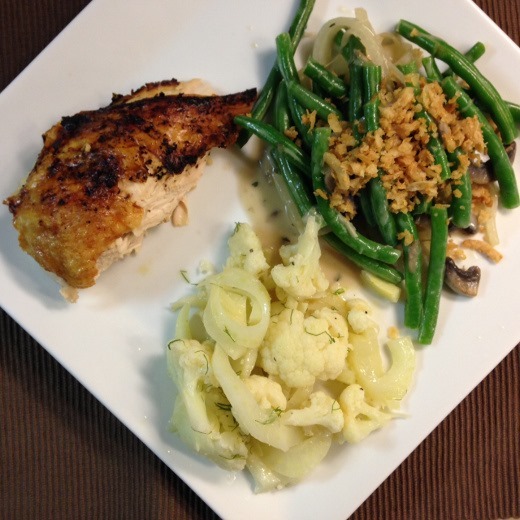 I absolutely love this green bean dish and I hope you give it a try! Bring 4 cups water to a boil in a large straight-sided skillet. Add 1/2 teaspoon salt and green beans. Reduce heat to medium; cook 6 minutes or until tender. Drain beans; rinse with cold water. Drain and set aside. Wipe skillet clean and dry with paper towels; return skillet to medium-high heat. Add oil to pan; swirl to coat. 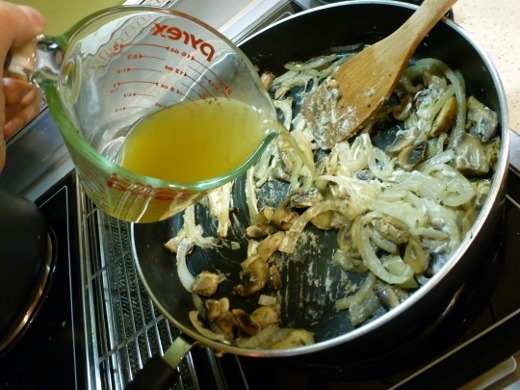 Add sliced onion; sauté 5 minutes or until lightly browned, stirring occasionally. 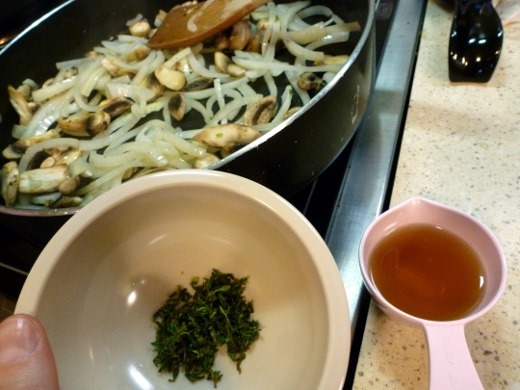 Add mushrooms; sauté 3 minutes or until mushrooms brown, stirring occasionally. Add sherry and thyme; sprinkle with remaining 1/4 teaspoon salt. Bring to a boil; cook until liquid almost evaporates. Stir in flour; cook 30 seconds, stirring constantly. Add cream cheese; stir until cheese melts. Stir in stock; bring to a boil, stirring constantly. Cook 2 minutes or until slightly thick. Remove from heat. Add beans; toss to coat. Sprinkle with crushed onions.